Studies in crop plants now routinely use DNA information, thanks to scientists in the 1960s who invented first-generation machines that interpret DNA information. These devices are often called DNA sequencing machines since DNA is arranged in a particular order. The DNA sequencing approach utilizes computer analysis to assemble DNA sequence from short pieces of DNA sequenced in sequencing machines, to align pieces of DNA sequence into references (e.g., known DNA sequence), or to directly deliver DNA sequence information that has been converted into readable formats. 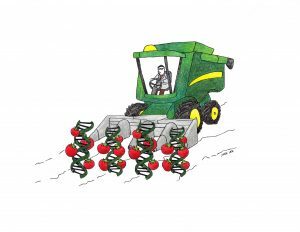 The recent advancement of DNA sequencing technologies that interpret DNA very quickly and inexpensively has great promise to make DNA sequence-assisted crop improvement achievable. The cost of current DNA sequencing is one hundred-thousandth of the cost of sequencing 10 years ago, and further advanced technologies are currently driving down sequencing costs and increasing capacity at an unprecedented rate. (To put this in perspective, imagine that the newest harvester is now at a much lower cost than the old John Deere model 4020.) Researchers quickly adopted these technologies, and many horticultural crops stand to benefit from applications of such technologies. How is the application of sequencing technologies now contributing to crop breeding? Once the DNA sequence information is collected, researchers can locate DNA regions (known as genes) associated with a particular phenotypic trait and collect information about potential functions. This process detects genes for important horticultural traits, such as disease resistance and fruit quality. Researchers then develop molecular markers to select for traits in the laboratory. The integration of advances in sequencing technologies with conventional crop breeding practices is beginning to revolutionize current crop improvement. A paradigm of conventional crop breeding has been enormously successful in creating cultivars with improved quality and productivity. Such a paradigm relies on a few molecular markers to select for phenotypes of interest or scoring plants based on their observed phenotypic characteristics to determine their value to breeding programs. This process is often labor- and space-intensive. Recent advances in sequencing technologies such as Illumina next-generation sequencing machines are enabling researchers to quickly and cost effectively sequence the entire DNA information of a target plant (whole-genome) on a high-throughput basis. Such technology, combined with better computational tools, has accelerated the genome-scale identification of genes associated with horticultural traits. 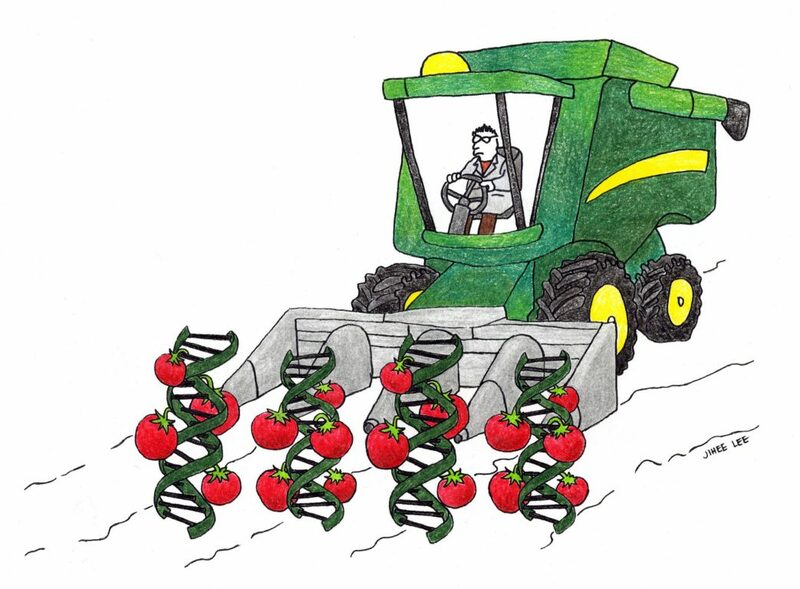 Sequencing also influences crop improvement through gene modification using methods such as CRISPR, a contemporary biological tool that can deliver a trait of interest to an organism such as tomato in the laboratory. Conventional breeding is not considered a tool of precision because it essentially involves a reshuffling of the deck of genes that exist between the parents, followed by multiple cycles of selection for genes of interest. In contrast, CRISPR has the proven ability to precisely change the DNA sequence of a gene. This ability is the main advantage of CRISPR over crossing methods of breeding. Yet, a major limitation of the current CRISPR method is that it can be targeted at a specific gene location, which is inevitably based on whole-genome scale sequence information, to prevent unwanted changes to similar or other DNA sequences besides the one of interest. It is difficult to overstate the potential of DNA sequence information for improvement in crop breeding. Whole-genome sequence information of major vegetables (such as tomatoes, cabbage, melons and cucumbers) in the southeastern United States has been available for some time. The availability of such information has already allowed a wide range of powerful methodologies to be applied to breeding. For example, the development of DNA markers to select for traits and identification of resistance genes has allowed great advances with broad impacts on the industry. However, to apply the full power of genome-scale sequence information to any given crop plant, the sequencing of whole genomes from multiple individuals (resequencing) of the same species (e.g., beefsteak and cherry tomatoes) is necessary to know the underlying DNA differences that drive phenotypic diversity. A future is now foreseeable where researchers may resequence their plant materials and perform breeding at a whole-genome level. With the collective efforts of scientists committed to breeding and technology, DNA sequencing technology will be further expanded and applied into crop improvement. Tong Geon Lee is an assistant professor in the Horticultural Sciences Department at the University of Florida Institute of Food and Agricultural Sciences at the Gulf Coast Research and Education Center in Wimauma. 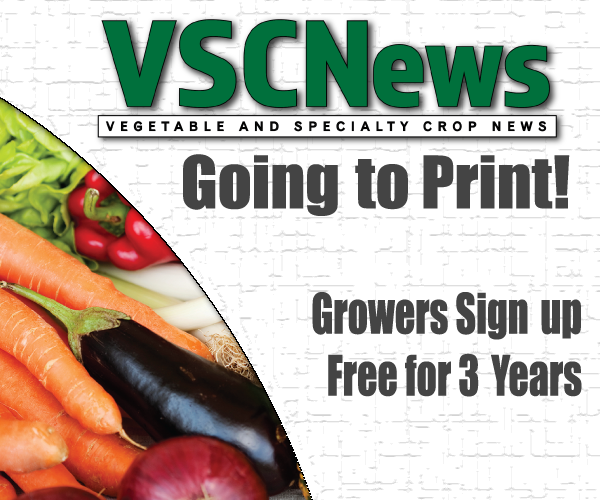 To receive future issues of VSCNews magazine, visit VSCNews.com/subscribe/.